Robert Manno is essentially self-taught as a conductor, having had the good fortune to observe and closely study numerous conductors in rehearsal and performance over many years working as a singer at the Metropolitan Opera, New York City Opera, and New York Philharmonic. Among those conductors were Leonard Bernstein, Carlos Kleiber, James Levine, Klaus Tennstedt, Karl Bohm, Seiji Ozawa, Giuseppe Sinopoli, Valery Gergiev, Bernard Haitink, Julius Rudel and many others. His first public appearances were leading La Boheme and Madama Butterfly with the Stuyvesant Opera in the 1970’s in New York City. 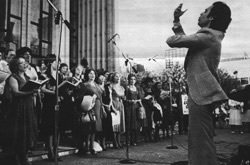 In 1980 he conducted the Metropolitan Opera Chorus in a free concert and later in the decade began leading performances of his own music. 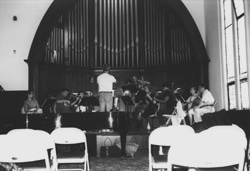 When he and his wife Magdalena Golczewski formed the Windham Chamber Music Festival in 1997, he began conducting performances at the acclaimed summer festival which attracted the interest of National Public Radio. 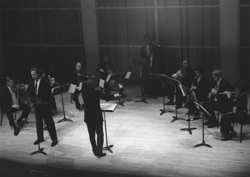 Since 2000, each year NPR has featured numerous live recorded performances led by Manno on its nationally syndicated “Performance Today” program. 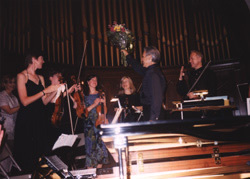 Along with his own music, he has conducted works by Bach, Vivaldi, Mozart, Wagner, Tchaikovsky, Dvorak, Mahler, Debussy, Grieg, Elgar, Copland, Gerald Finzi, Romeo Cascarino and others. 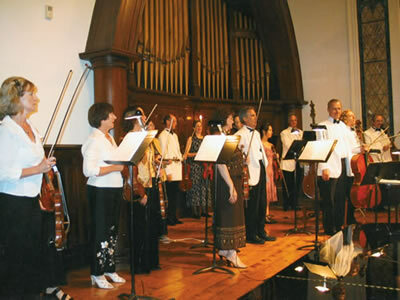 He is the Music Consultant to the Catskill Mountain Foundation and the Music Director and Conductor of the Catskill Mountain Chamber Orchestra, which made its debut in November 2004 at the Catskill Mountain Foundation Performing Arts Center. Musical excerpts featuring Manno’s conducting are available here.